It doesn't matter what your bathroom looks like, bathroom resurfacing with Worldwide Refinishing Systems will make it look a lot better! During the procedure, surfaces and grout lines are repaired and ugly colours are replaced by white or other colour of choice. The resurfacing process also seals the grout lines, preventing future mould and discoloration. If there are issues relating to dampness, plumbing leaks, wall cracks, etc, these should be resolved before commencing the bathroom resurfacing process. Pedestal basins and vanities may either be replaced or resurfaced depending on condition. In some instances, toilets can be resurfaced externally and on the inside rim, but not the pan. Floor tiles can be resurfaced in some bathrooms and although the improved appearance will be pleasing, the new surface will not be as tough and hard wearing as the original kiln fired finish on the tile. Floor tile warranties cover loss of adhesion but not chipping, scratching or loss of gloss in high traffic areas. Any combination of Bath, Basin, Wall Tiles, Vanity and Shower Floor Tiles can be repaired and resurfaced, resulting in a beautiful bathroom makeover. Based on their condition, toilets, old cupboards and any other worn or damaged fixtures may not be suited to resurfacing and should be scheduled for replacement before or after the resurfacing process, depending on the situation..
How can you tell a quality bathroom resurface? Refinished surfaces should be flat and highly reflective, without noticeable application faults such as sagging and 'orange peel'. The surface should not require buffing and the cover (opacity) should be 100% without any 'show through' to the old colour or pattern beneath. 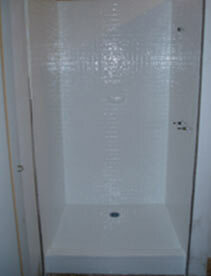 The dry film thickness should not be less than 120 microns, sufficient to provide an extended scrub life. Applicators using the Classic Surface resurfacing system from Worldwide Refinishing Systems have completed many projects for international hotel chains, major property developers and housing departments around Australia since establishment in 1990. The strong relationship with the commercial and government sectors is the direct result of reliable workmanship, reliable service and excellent resurfacing systems that have stood the test of time for over 30 years. How much does Bathroom Resurfacing cost? When you call 1300 360 660 and identify your location, your enquiry will be referred to the nearest Worldwide Refinishing Systems accredited bathroom resurfacing contractor. Alternatively, we will provide you with contact details to make direct contact yourself. Your questions will be answered and the approximate cost may be advised over the phone. For bath and tile resurfacing work combined, a site inspection is necessary and will be arranged to suit you. Read more about the cost. 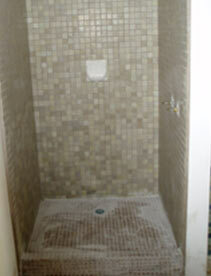 Before: Tiles & Bath Remain. Basin and WC removed. After: Tiles & Bath Resurfaced. Floor re-tiled. Pedestal and WC replaced. Before: Dark Old Mosaic Tiles & tired enamel bath with scratched and stained bottom. After: Gleaming White Tiles & Bath. Grout lines still visible but completely sealed by resurface. and difficult to keep clean. Gleaming White resurfaced wall and floor tiles, all Grout Lines Sealed! Bathrooms can be potentially hazardous for young and old alike, even after bathroom resurfacing. The wet surface in a bath, shower tray or tiled bathroom floor can be very slippery if not treated and may give rise to a painful, slip-fall injury. The very old and very young are statistically most at risk but slip prevention measures are unfortunately rarely taken seriously until after the accident has occurred! Several measures can be taken to reduce slip-fall hazards in the bathroom and around the home. Find out more about Anti-Slip Systems treatments available through independent applicators authorised by Worldwide Refinishing Systems. Some authorised applicators offer a range of related services including bath repairs, antique bath restoration and cabinet resurfacing. If you need any of these services, please first check availability in your area.